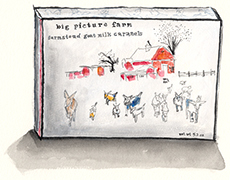 Big Picture Farm started in 2010 with a small herd of goats in the hills of southern Vermont. They use their fresh goat’s milk in their little creamery and confectionary. Since the beginning their caramels have won a huge following and lots of awards because they’re so delicious. Caramels made with goat’s milk have a softer texture than traditional caramels, so you won’t lose a crown chewing one. Four flavors included in each box: Sea Salt & Bourbon Vanilla, Maple Cream, Chai and Cocoa Latte. Their illustrated graphics are fun and attractive. Great gift for any sweets lover.